These songs were song with percussion supplied by tapping arrows against bows. With the one the Creator made for me? Hįha! Given the importance of the Heroka, they have become the objects of human devotion. Below is an account of the feast of a society a people who have been blessed by these spirits. The Society of Those who have been Blessed by the Heroka. This society gives a feast whenever they wish and they are free to invite anyone. A group of Society members sponsor the feast, which is held in a long lodge. Every participant brings his bow and arrows and is responsible for supplying a deer. Each member paints his bow and arrows in the particular color with which the Heroka have blessed him. The bows are stuck in the ground in a row with the arrows behind them. They make these rows between the first two fireplaces. The leader of the Society paints his body the same color as his arrows and has a headdress with a single horn surmounted on it. Instead of using gourds for percussion instruments, they fashion strings of deer hooves which they rattle during songs and dances. The members have been blessed by the Heroka with certain songs which they sing at various times during the ceremony. The ceremony, which precedes the feast, begins with a dance. The leader of the dance carries a flute from which he plays a song both before and after the dance. One of the members takes his bow in hand and the rest follow behind him carrying their arrows. The followers whoop while they pat their mouths with their hands. Only the men perform this dance, there being only a few dances in which women can participate at all, and those are restricted to post-menopausal women. Commentary on the Feast. "bow and arrows" — the bow and arrows is the very essence of the Heroka, as we see (above) in their emblem. "a single horn" — inasmuch as Herokaga was originally known as "One Horn" it is appropriate for the leader to have a single horn on his head. His body is the same color as his arrows because he is symbolically an arrow himself. We learn from one waiką that the arrow is a "horn," and when made of sacred cedar, it is a red horn. The spirit Redhorn is chief of the Heroka. Most arrows were just wood with sharpened tips, but others have a Turtle claw head, or one of flint or obsidian. This is symbolized in the single horn worn by the leader. It is the counterpart of the Deer's antler weapon. "strings of deer hooves" — this reflects the prowess in hunting deer with which the Heroka often bless people. This is not the gourd music of vegetarians, but the music of carnivores. Deer hooves are also cervid weapons that are at once fleet as well as deadly. Thus, they are like the arrow. "post-menopausal women" — women past their climacteric are said to be "the same as men." Menstruation is thought to weaken the spiritual power of weapons. "forked sticks that have been whittled down at one end" — the forked stick at first evokes the image of the cervid antler, but the whittling reveals it (also) to be an image of the bow (the fork) and arrow (the straight sharpened stick that emanates from the arch of wood). Indeed, the bow and arrow is a food utensil, an implement by means of which one feeds oneself. It can also be thought of simultaneously as an antler since it attaches itself to deer meat, is forked, and is the counterpart to the deer's weapon. Links: Redhorn, Little Children Spirits, The Redhorn Panel of Picture Cave. An American Star Map, Flint, Spirits, Great Black Hawk, The Forked Man, Wolf & Dog Spirits, Deer Spirits, Beavers, Iron Spirits, Rock Spirits, Morning Star, Herešgúnina, Redman, Otters, Wildcats (Bobcats), Lice. Stories: featuring the Heroka as characters: The Chief of the Heroka, The Red Man, The Oak Tree and the Man Who was Blessed by the Heroka, The Baldheaded Warclub Origin Myth, Little Human Head, Morning Star and His Friend, The Claw Shooter, Redhorn's Sons, The Origins of the Milky Way; featuring lilliputian people: The Chief of the Heroka, Morning Star and His Friend, Iron Staff and His Companions, The Red Man. Themes: lilliputian people with great hunting skills: The Chief of the Heroka, Little Brother Snares the Sun, The Red Man. 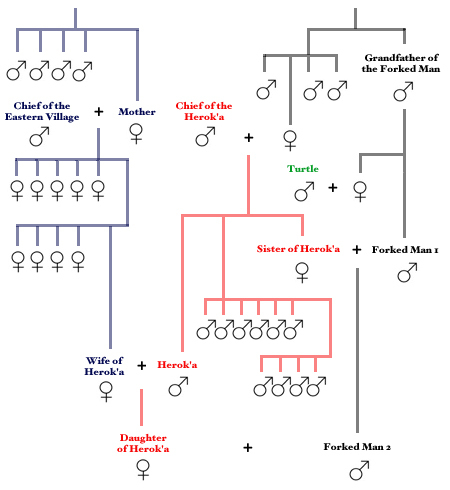 Genealogy: The Chief of the Heroka (+ Forked Men). 1 Paul Radin, The Winnebago Tribe (Lincoln: University of Nebraska Press, 1990 ) 393. 2 W. C. McKern, Winnebago Notebook (Milwaukee: Milwaukee Public Museum, 1927) 64. 3 Paul Radin, "Redhorn's Sons," Winnebago Notebooks, Freeman #3860 (Philadelphia: American Philosophical Society, 1908-1913) Winnebago IV, #7a. 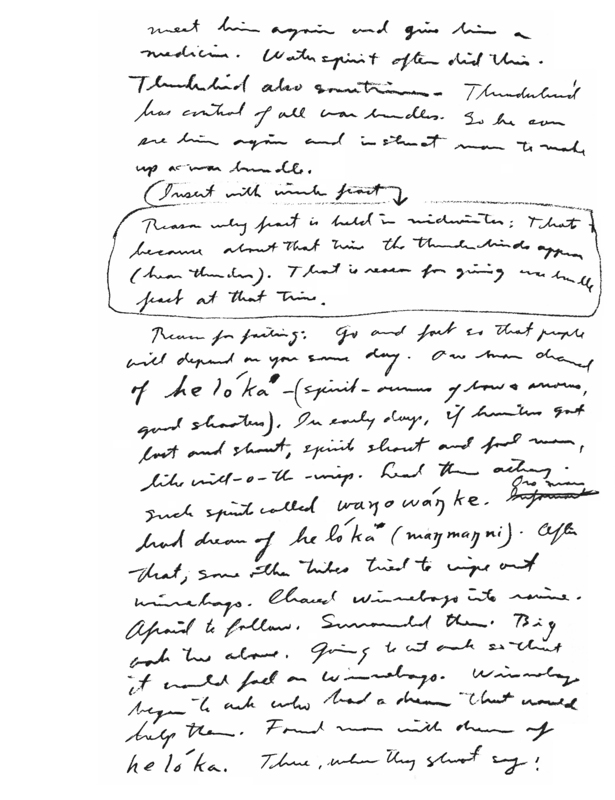 4 Paul Radin, "The Squirrel," Winnebago Notebooks (Philadelphia: American Philosophical Society) Notebook #22: 1 - 85. Hočąk syllabary text (by Sam Blowsnake?) with an interlinear translation by Oliver LaMère. 5 Radin, The Winnebago Tribe, 200-201. 6 McKern, Winnebago Notebook, 64. 7 Alanson Skinner, "Traditions of the Iowa Indians," The Journal of American Folklore, 38, #150 (October-December, 1925): 425-506 [441-446]. 8 Paul Radin, "Chief of the Heroka," Winnebago Notebooks (Philadelphia: American Philosophical Society) Notebook #33: 65. 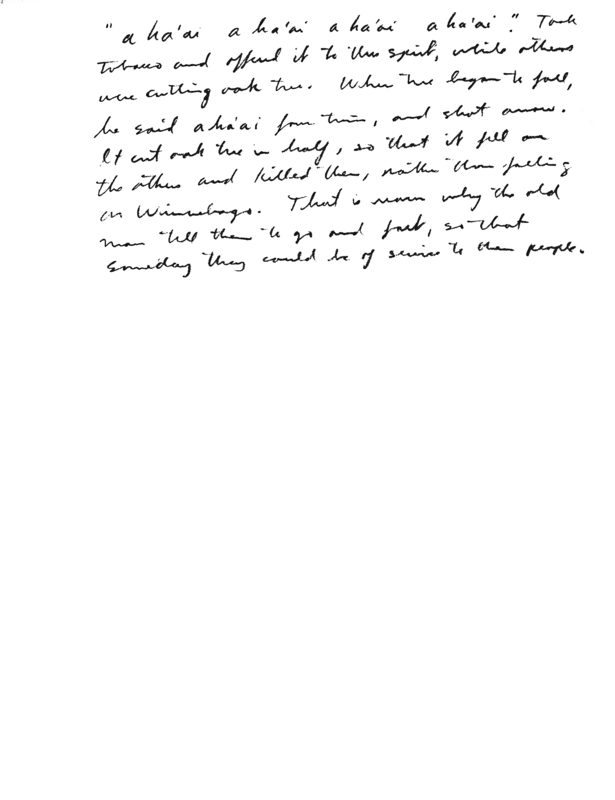 9 Paul Radin, "The Man's Head," Winnebago Notebooks (Philadelphia: American Philosophical Society) Notebook #51. 10 Radin, "Chief of the Heroka," 49; Susman records the breathing as ahé. Amelia Susman, Notebooks (Philadelphia: American Philosophical Society, 1939) Book 10: 79. Informant: Sam Blowsnake. McKern has a ha’ai. McKern, Winnebago Notebook, 65. 11 Paul Radin, The Road of Life and Death: A Ritual Drama of the American Indians. Bollingen Series V (Princeton: Princeton University Press, 1973 ) 156. 12 McKern, Winnebago Notebook, 65. 13 Radin, "Chief of the Heroka," 43-48. 14 Radin, "Chief of the Heroka," 63. 15 Radin, "Chief of the Heroka," 65-66. 16 Paul Radin, "A Wakjonkaga Myth," Winnebago Notebooks (Philadelphia: American Philosophical Society) Notebook #37: 55-57. 17 Paul Radin, "The Red Man," Winnebago Notebooks (Philadelphia: American Philosophical Society) #6: 1-72. 18 Susman, "Herók'a," Notebooks, Book 10: 79. Informant: Sam Blowsnake. 19 Susman, "Herók'a," Notebooks, Book 10: 79. 20 Radin, The Winnebago Tribe, 295. Informant: a member of the Bear Clan.